Due to its flavor similarities, hot chocolate and cigars actually make a great pairing. Check out our top infused and non-infused combinations! You may probably think I’ve lost it, but hot chocolate is a fan favorite in the cigar industry. If you think about it, hot chocolate can be a great companion when paired with the right cigars. Chocolate assists with bringing out similar flavors in the tobacco along with some earthiness and creamy notes in a richer cigar. Here is a list of the best infused and non-flavored cigars to enjoy on a cold winter’s day, as hopefully winter will not be around too much longer. The infused Java line was made to be paired with a cup of hot cocoa. The Java Maduro uses the finest tobaccos from Nicaragua that are enhanced with flavors of coffee, cocoa, and a hint of vanilla. The Java Latte is draped in a silky Connecticut wrapper resulting in a delightful milk chocolatey smoke. Java Red is a rich amalgam of cherry with notes of dark cocoa and coffee. Java Mint is a medium-bodied cigar filled with hints of mocha, coffee, vanilla, and mint. If you're looking for a sweet cigar to mix things up, Java cigars are a top-notch choice. Tabak Especial Negra by Drew Estate has a rich, super dark Maduro wrapper blanketing coffee infused tobacco from Nicaragua creating rich flavors of espresso, cedar and a touch of earth. The rich tobacco in Tabak Especial Dulce is infused with fair trade coffees harvested in the mountains of Nicaragua. The result is a medium to full-bodied smoking experience with natural tobacco flavors and hints of smooth espresso and luscious caramel, perfect with a rich, dark hot mocha. Ambrosia Nectar is a blend of choice Nicaraguan tobaccos infused with native South Asian and European spices and a mellow Connecticut wrapper infused with a matrix of mysterious flavors and aromas that linger on the palate. 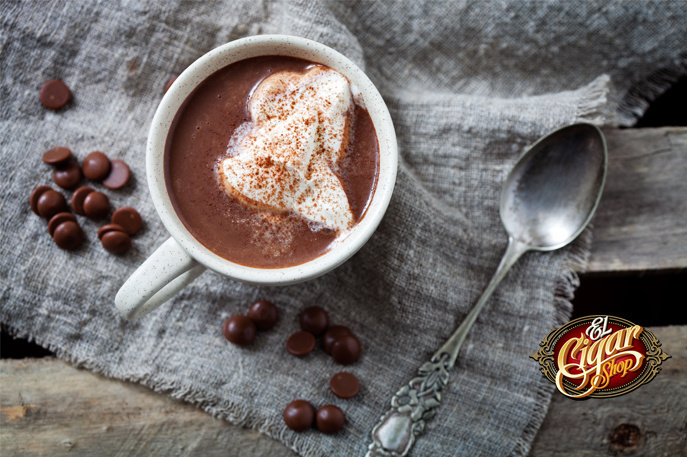 Ambrosia Nectar has exotic flavors including clove, star anise, coffee and black pepper that pair so well with a hot milk chocolate. Ambrosia Nectar has the essence of the holiday season. The NUB Connecticut’s silky smooth wrapper from Ecuador provides a medium-bodied smoke, creamy and mellow with a buttery texture with accents of coffee and cedar and just the right amount of sweetness. A Rich, thick dark cup of chocolate helps balance the buttery sweetness of the NUB. The Perdomo Habano Bourbon Barrel Aged Series starts with either a Maduro or a Sungrown wrapper and long filler Nicaraguan tobacco aged in bourbon barrels. The Sungrown is a medium to full bodied smoke delivering earth, spice, espresso, and vanilla with smokiness from the bourbon barrel aging. The Maduro version is medium to full-bodied with rich notes of cocoa, espresso, and almond with a hint of bourbon. Each cigar pairs excellently with a hot chocolate laced with bourbon or Irish whiskey, if you prefer. A Cohiba Blue is a unique three-country blend of Nicaraguan, Dominican Piloto Cubano, and Honduran tobaccos that are all held together by a Rosado Olancho San Agustin wrapper from Honduras. Medium body in strength, Cohiba Blue provides a natural Cuban-style tobacco sweetness and notes of cocoa, caramel, cinnamon, and light leather. A spicy Cohiba Blue and a Mexican hot chocolate will take the chill away. Here are some hot chocolate recipes to pair with these or your own favorite cigars. Pour your milk of water into a tall narrow pot over very low heat. Add 2 bars of chocolate (approximately 6 ounces). When the chocolate starts to dissolve gently move it until it fully dissolves, about 20 minutes. Once all of the chocolate has fully dissolved, vigorously froth the drink with a wire whisk for 10 minutes to develop a frothy creamy texture. Combine Valrhona brand 100% cacao powder with turbinado sugar at a 1:3/4 ratio (1 part cacao powder to ¾ part turbinado sugar). Add hot water lightly while stirring, to reach a thick, rich, liquid consistency. Final ratio should be approximately 1 part cacao powder to ¾ part turbinado sugar, to ¾ part water (by volume) Store refrigerated in a sealed container. To make one serving mix 3 oz. cocoa mix with 8 oz. milk and warm over medium heat. In an Irish coffee mug add equal parts liquor to hot chocolate, top with whipped cream, shaved chocolate, and garnish with a cinnamon stick. Place chopped chocolate in an Irish coffee mug.Pour the hot milk into the mug and let stand for 2 minutes, and then stir with a spoon until smooth. Add bourbon stir to combine. Garnish with Bourbon whipped cream. In a medium bowl, whip cream until soft mounds form. Gradually add sugar, whipping until cream forms stiff peaks. Gently fold in bourbon. Chill until ready to serve.